Einstein's General Theory of Relativity demonstrates that a large mass can deform spacetime and bend the path of light. So, a very massive object, such as a cluster of galaxies can act as a gravitational lens. When light passes through the cluster from an object lying behind it, the light is bent and focused to produce an image or images of the source. The image may be magnified, distorted, or multiplied by the lens, depending upon the position of the source with respect to the lesnsing mass. The characteristics of the gravitationally lensed image depend upon the alignment of the observer, the lens and the background object. If the alignment is perfect, the resulting image is an Einstein Ring, shown to the left. This object, discovered by Radio Astronomers at England's Jodrell Bank Radio Observatory, then imaged in the near infrared with HST is probably a distant background galaxy lensed by an intermediate distance Elliptical galaxy, shown as the bright image at the center of the ring. The Ring is estimated to be about 10-20 times brighter than the background galaxy would appear without lensing. If the alignment is not perfect, then multiple images are formed rather than a ring. The object to the right, called the Einstein Cross, shows four images of a distant quasar at a redshift, z=1.7, imaged by an intervening spiral galaxy with z=0.04. HST images have been processed to separate the galaxy and quasar images. A gravitational lens is most effective if it is near midway between the observer and the distant object which is being lensed. The amplification, ratio of the lensed brightness of an object to its unlensed value, is larger if the line of sight passes very close to the lens. Lenses can amplify brightnesses by a few times, up to over a factor of 100 - this means that lenses offer the potential to "see" objects over 10 times further away. Galaxies- Massive galaxies can also act as gravitational lenses. Light from a source lying behind the galaxy is bent and focused to create an image or images of the source. Clusters of Galaxies- As shown above for CL 0024+1654, a massive cluster can create images of a distant object lying behind it, usually in the form of distended arcs - a sector of an Einstein ring. 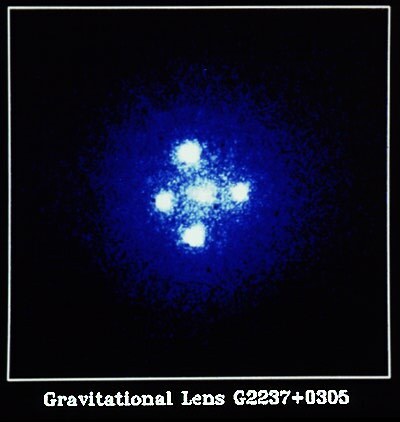 Cluster gravitational lenses allow us to observe objects that are much too distant or too faint to be seen directly. And, since looking out to greater distances means looking farther back in time, we gain access to information about the early universe. APOD images of Gravitational Lenses. 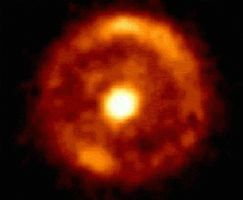 A Gravitational Lens Experiment you can do yourself.